Freshbooks. If you haven't heard of Freshbooks before, it's known as "The Leader of Online Invoicing". It's an extremely beneficial business tool, especially for those who are looking for any type of outside sales or field service automation. Unfortunately, not everyone is on board with this type of service and some are still using manual invoices, stacks of paper and other handwritten forms that could become a headache for any accounting department. It's also a valued option for those who wish to keep track of their team, manage contractors, estimates and, of course, their clients. 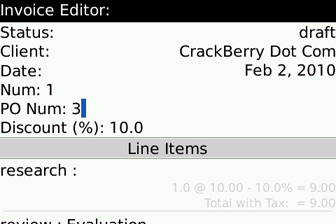 Now while Freshbooks can be accessed from your BlackBerry smartphone, it isn't properly formatted for optimal viewing. With those out in the world wanting to carry increasingly smaller devices, they want to be able to only use their smartphones. Freshbooks does have an application that's currently in beta; I believe it's waiting for approval for entry into the App World to be precise. I'll talk about that app in the near future. Right now we're going to have a look at another option called ReportAway! for Freshbooks, not to be confused with the standard addition of ReportAway! for Quickbooks. The ReportAway! for Freshbooks application will provide you with the benefits of Freshbooks, without tying you to a computer. Read on for more. If you don't mind, ReportAway! For Freshbooks is a bit of a mouthful to repeat over and over. I'm going to refer to it as ReportAway!, so please don't confuse it with the previously mentioned standard edition. ReportAway! was developed by Acire Systems Inc, a Canadian company, which was founded in 2008. The application is currently in version 2.1.1 and requires 289 KB. From information found in BlackBerry App World, a fair number of BlackBerry models are supported, as long as they're running OS 4.2 or higher. 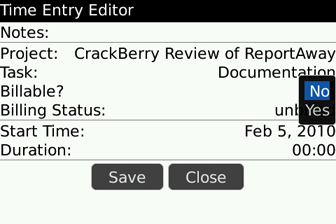 BlackBerry App World has this application listed as free, but it is actually a free trial. ReportAway! is available via annual subscription of $23.99. They do have a promotion on for the month of February; Pay $14.40, thereby saving 40% off the first year. Keep in mind that you still have to have a FreshBooks account, in order to use the ReportAway! application. Accounts pricing range from free to $149/month; depending on your client base and number of employees allowed to have access. For more information on Freshbooks pricing, click here. Time – Want to remember how much time you spent on a special project? Wishing to check up on how long your team was at a site for? ReportAway! allows for rapid time recording. Each entry can include: project name, type of task, billing status, date and duration. Tasks include items like Meeting, Sales, Support, Evaluation, etc. There is also the option to input any notes for future reference. You can then browse entries for editing, duplication and easily create an invoice for any of the entries. Speaking of invoices, let's look at that next. Invoices – As much as you want to help out your clients, you will have to charge them once in a while. Luckily, you can whip out an invoice before you they can feel the sting of the bill. 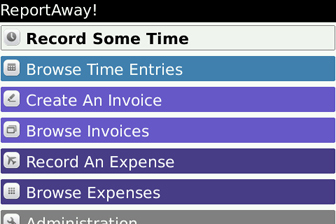 The invoice editor simplifies the task of calculating taxes and discounts. 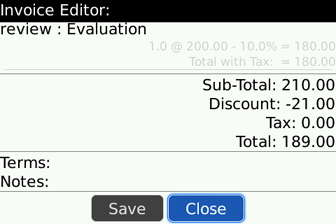 You can add discounts by percentage, which is automatically reflected as you create line items for the invoice. Before taxes can be applied, you must manually enter them into the applications Tax Code List. Once that is done, however, ReportAway! will be more than happy to calculate taxes for you. ReportAway! also provides a manageable Task List. This list offers quick templates that detail the type of task, the rate and whether it is billable or not. You can also create a line item from scratch; keeping track of quantity, price and such. The invoices are broken down making them easy to decipher. Each line item will display quantity, cost, discount and total with tax. Now you can quote pricing to a client with confidence and without confusion (which may lead to conflict). 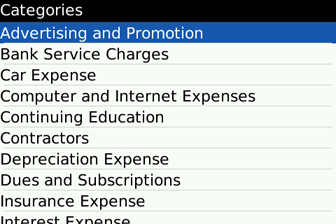 Expenses – We all know it takes money to make money, and now you can track your expenses. Like invoices, you can keep track of cost, taxes and discounts. Related projects, billing status, dates can also be captured for reference. If your boss needs to know why exactly they're shelling out money, you can categorize the expense (car expense, dues, advertising, etc). I would suggest visiting the Administration section of ReportAway! before using the application. This section is where you can manage you clients, projects, task, categories and tax code list. Take the time to add, edit or delete items so you can create invoices, expenses and record time much more quickly and efficiently. I was hoping to see more fields for Client information. Right now, you can add the Company name, contact name and email address. I guess that's what your native Address Book is for. The Project editor does a great job of capturing billing information- you can choose the rate, the billing method (hourly) and the client it reflects upon. I did appreciate seeing native calendar and task integration. When viewing these two applications, you can choose to import the items as a time or expense entry. This makes it easier to integrate ReportAway! into your routine. Your clients will feel more important, as you will be able to focus more attention to detail on a personal level vs. mounds of paperwork. Using ReportAway! with Freshbooks will also save you, and your boss from headaches generated by a paper and pen. I would suggest taking the price into consideration and make sure that this is really for you. Again, it's available for $23.99 annually, but for the month of February, you can pick it up for $14.40. Check out ReportAway! for Freshbooks at BlackBerry App World.